2017 sure was a fantastic year for video games, wasn't it? No matter what genre you're a fan of, you're likely to have at least one fantastic game released that you'll love. It's been pretty great for RPGs too… but I don't think I have the stamina to play a bunch of RPGs in a row like my fellow writers. I need a palette cleanser! The fact that I found it difficult to narrow my list down to ten games this year, where oftentimes I can have trouble filling GOTY lists with ten titles signals to me how great this year really was for video games. But enough talk, I'll let the list speak for itself. I nearly forgot about Specter of Torment, Shovel Knight's latest expansion that got lost in the shuffle with all the other megaton hits that got released in the Spring. But, Specter of Torment is an absolute blast to play, and dare I say, I might even enjoy it more than the original. Specter of Torment is fast paced and well crafted, and serving as a prequel to Shovel Knight itself has a surprising well-written plot. Each version of the game is great on its own already, but I hold the fondest memories of this version of it in particular. A lot of people bought a Switch for Breath of the Wild. Being the rebel I am, I bought the latest Zelda title for the Wii U, and bided my time until Switches weren't almost impossible to find to pick one up. My first game? Splatoon 2. I got in late on the first title, but when I picked it up I loved it. Even if I wasn't particularly great at shooters, the focus on inking turf over killing enemies made it so that I can be useful to the team. Splatoon 2 is basically the original, but more. More maps, a new mode, and more. Nintendo has really been pushing new content and updates for the game too regularly, keeping even daily players with something to do with a brand new ranked mode. Oh, and they made it so you can actually change equipment in the lobby finally, so they're even listening to longtime veterans, which is always a good sign. Doki Doki Literature Club is a strange beast. It's one of those games that you can't openly talk about what's so great about it without ruining the surprise, but going "just trust me and try it" isn't exactly the way to get people to try the visual novel out. What I can say though, is that the game is free and only four or so hours long, so it's easy to fit into a slow afternoon. I will note that you definitely should NOT take the trigger warning at the beginning of the game lightly—Doki Doki Literature Club gave me a few moments of anxiety during my playthrough, so take caution. Like many Fire Emblem veterans, I came away a bit disappointed with last year's Fates. While in terms of gameplay and mechanics, Conquest is a standout game, but the plotline of all three games grated on my nerves. The fact that there were three full-length games, and two of them weren't very fun to play, did not sit well with me. I was also a bit skeptical of Shadows of Valentia. When I heard that the game would retain most of black sheep Gaiden's strange mechanics, I immediately thought it was a mistake. Intelligent Systems managed to pull it off well, although they could have worked a bit more to fix up the maps from the Famicom original. Moreover, despite Shadow of Valentia's story being rather basic and plot twists heavily foreshadowed, the dialogue is written well, and the side characters are given enough backstory to make them feel like more than cardboard clichés. 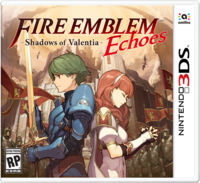 I would dare say that Shadows of Valentia is the best of the 3DS Fire Emblem titles. Persona 5 is a game I've waited years for. I played Persona 4 with its PS2 launch, and while I didn't enjoy it as much as Persona 3, I was still looking forward to the popular Shin Megami Tensei subseries' next entry. It's not a perfect game, as the game feels bloated in its misguided need to be long, but it's very much a step forward for the series and lives up to expectations with its super stylish execution. I was originally skeptical of Pyre when I started playing it. The gameplay was a bit strange, and everything felt so linear and rushed. However, when I got to what seemed like the end and Pyre opened up, I was won over. When the plot revealed the importance on deciding who would return to help in the revolution, and who may be stuck in a harsh world of exile forever, it put a lot of weight onto what you'll so. Sending home an ally means hobbling your party, and many of your opponents also have their reasons to return, which may hurt the revolution but change their lives. Supergiant made an incredible story with actual weight behind the decisions you have to make. Honestly, for most people, a Mario game just being a Mario game will make it land on their game of the year lists. But for me, what makes me like Super Mario Odyssey is what it does differently from its 3D Mario predecessors. Super Mario 64 and most mainline Mario games afterward focus on collecting stars, skillfully working through levels collect enough to move on to the next set of areas. Odyssey does something similar, but instead of having a somewhat limited number of Moons to collect and forcing players to overcome more specific challenges, Nintendo blows it wide open. With 999 total Moons to collect, the likelihood of anyone getting stuck and frustrated pretty much goes to zero. See, in most 3D Marios I would get annoyed or stressed out near the end of the game. While early Stars can be easy to grab, they can get significantly harder to obtain as you move on. Oftentimes I would end up in the final set of levels short on Stars to end the game, left only with Stars to collect that would either a massive pain or just too hard to grab. With Odyssey, though, provided I explored each world and tried playing with the environment, I found it easy to collect enough moons to move forward, while still feeling overall rewarding. Yakuza is a series I've always vaguely known about but never bothered to play. I had a number of people on my Twitter timeline singing the praises of the series for years, but it wasn't until Yakuza 0 that people started being really vocal about the series. Of course, being released in one of the biggest years for gaming meant that I had other games to prioritize buying, so I didn't pick up the title until late in the year, and only got time to play it just in time for Game of the Year deliberations. I feel like I've done Yakuza 0 a disservice, because it's an absolutely fantastic game. While most people talk about the wacky side-stories that you'll encounter, Yakuza 0 has a very serious and dramatic main story, and it's an incredible ride all the way through. There's some really touching and suspenseful moments there, and some later scenes left me an emotional wreck. I also have to commend the game's snappy pacing, as the main story doesn't take too long to get through on its own. Of course, the side stories are great and managing properties and cabaret clubs are likely to add quite a bit to your game time, as they are thoroughly enjoyable. Breath of the Wild is flat out a masterpiece. It'll be one of those games that gamers look back to 20 or 30 years from now as one of those defining titles, similar to how we look at a variety of retro games today. BOTW manages to revitalize the Zelda formula in a way that easily could have gone poorly for the title, with its vast open world and overall lack of direction. Breath of the Wild wants you to explore, but unlike many of the open world titles that want the same, it doesn't bog you down with mountains of collectibles and waypoints—you're more or less on your own. And it's brilliant. I spent over 60 hours playing the Wii U version and exploring Hyrule never felt old… even watching others play is a joy, as they discover new paths and solutions to situations that I never would have thought of. It's hard to say if Nintendo can make lightning strike twice with this formula, but the future of series will be interesting to see. I was a big fan of the original NieR. When Automata was announced, I was undoubtedly excited, but there was something else about the game that piqued my interest—Platinum Games was helping to work on the title. While I'm not the biggest fan of Platinum, I do believe they make great games mechanically, and any long time fan of Taro's work will know the gameplay of NieR and especially the Drakengard games are lacking. My hype for the game was through the roof, but I didn't even buy the title day one. There was just too much coming out at the same time, and my wallet was empty. Once I finally got Automata a couple of months later, though, I picked it up and didn't put it down until I got the Platinum, it was just that great. The story is the usual Taro fare, which means it's fantastic. I laughed, I cried, I had an existential crisis for a couple days after I beat the game. The gameplay wasn't completely perfect, and you could tell the game was on a tight budget, but it's a marked improvement over previous Drakenier games. Automata is the game that managed to bring Taro's work to a wider audience, and for good reason; it's an absolutely fantastic game.